The state of Kentucky in the USA is divided into 120 counties, each with their own county-level government, in addition to state and federal governance. The capital of Kentucky is Frankfort, which is part of county seat of Franklin County. Kentucky consists of 120 counties, one of the highest number of counties of any state in the USA, despite being a relatively small state. Kentucky's many counties were created because of political disputes, which caused divisions of the land into small county governments that could enjoy a small. degree of self-governance. Because of the high number of counties in Kentucky, the state government made the guidelines for creating a new county more stringent. Each county in Kentucky is governed at the county seat, which serves as the capital of the county. The largest county in Kentucky by area is Pike County, located in far eastern Kentucky. The county seat of Pike County is called Pikeville. 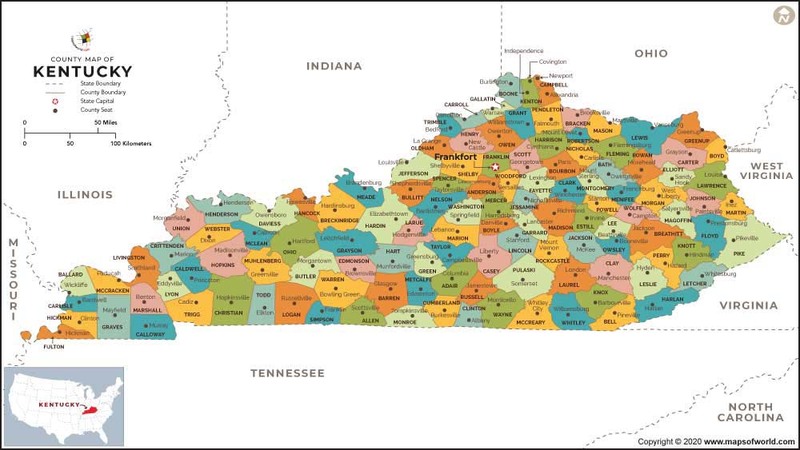 Kentucky's largest county by population is Jefferson County, with a population of 741,096. Jefferson County is home to Louisville, the largest city in Kentucky and the county seat. Frankfort is a city in Kentucky that serves as the state capital and the county seat of Franklin County. Located on the Kentucky River, Frankfort is the principal city of the Frankfort, Kentucky Micropolitan Statistical Area, which includes all of Franklin and Anderson counties.